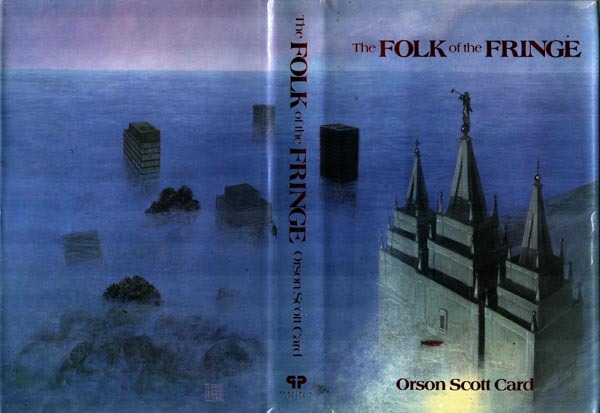 Statement on the imitation page (the last page before the back free endpaper): "This first edition of THE FOLK OF THE FRINGE by Orson Scott Card is limited to three thousand four hundred seventy-five copies. The first four hundred seventy-five copies have been numbered and signed by the author in a specially bound and boxed edition". This record is for the 3000 trade edition. Year of publication stated on the title page. Month of publication from Locus1. "Cover Painting by Carl Lundgren" (over) "Interior Painting by Glen R. Bellamy" printed on the back flap of the dustjacket. Bellamy's painting is used as both front and back endpapers.